The European Economic Advisory Group (EEAG) report 2018 begins with a review of the economic conditions and outlook in Europe and the world. Both are benign at present, but a decade of economic and migration crises and Britain’s decision to exit pose a strong challenge to the previous path of ever closer union and bold enlargement in Europe. The rest of the report focuses on the symptoms of and possible cures for the current integration malaise in Europe. 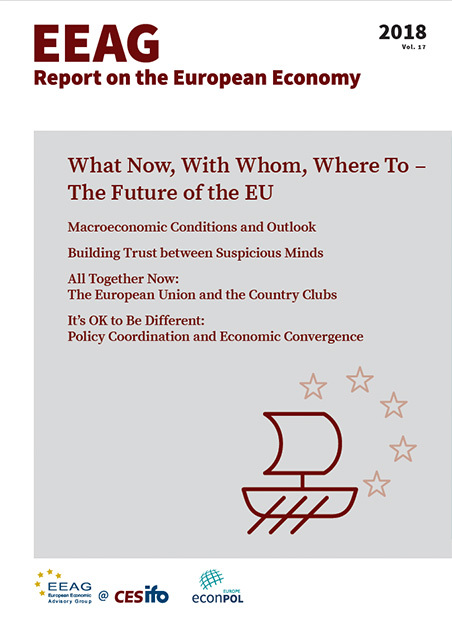 It highlights the role of trust in allowing not only national and supranational organisations, but all human societies to function; reviews the role of admission criteria and governance rules in the operation of clubs that supply services to their members within states; and considers economic convergences and public policies across EU countries.